I love cherries. I love the colours. I love the taste. I love rolling the seeds around in my mouth and sucking on them to get all the fruit off. Recently I've seen some very cute vintage dresses with cherry print and it reminded me that somewhere in my vast collections of stamps I had a cherry stamp. Inspired as I was I created this simple card. As often happens when I'm inspired, I couldn't stop at just one. I had to make a set. I carefully hand inked each stamp for each card using a combination of inks and pens. 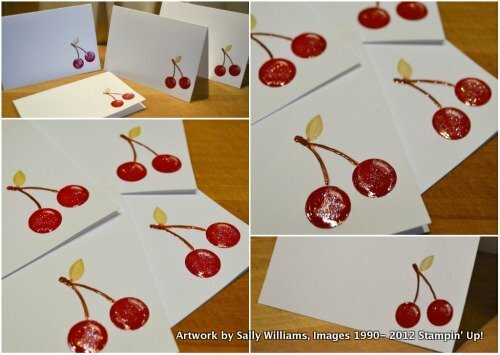 After stamping I used some crystal effects to give the cherries a glazed, shiny look. A little dazzling diamonds to each cherry finished of the effect. Total cost for all the above (including shipping) is $130.70. And if you order before 31 March 2012 you'll get a free product from the Sale-a-bration catalogue. Alternatively if you just want to get you hands on the cards you can head on over to my store on madeit.com.au and they'll be available for sale later today. You've done a great job of these Cherries Sally, I love em. Thanks. I had so much fun making these.